Welcome to The Abso!ute Sound online! We explore music and the reproduction of music in the home. We believe that the sound of music, unamplified, occurring in a real space is a philosophic absolute against which we may judge the performance of devices designed to reproduce music. Our goal is to provide the resources consumers need to judge how a component's sound either honors or departs from the music's truth, and to make sound purchasing decisions that maximize their experience of reproduced sound. Below is our Issue 162, June/July 2006 table of contents and editorial. Consistently elegant, detailed, and natural is how Wayne Garcia describe sthis vacuum tube beauty, with additional comments on Hovland's solid-state RADIA amp and cables. ...while at the other extreme, Alan Taffel takes a $55,000 peek into the digital future. Jacob Heilbrunn listens to a two-box, tube-driven, Italian phono preamp. Sallie Reynolds on an imperfect design that nonetheless possesses magical power. Jim Hannon reports on a new and different breed of amp. Neil Gader on an expensive but superb power cord. New contributor Max Shepherd used to think a dedicated line was enough. 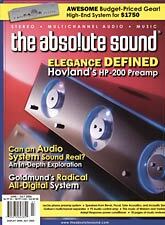 Sue Kraft reports on three affordable items from audio veteran Frank Van Alstine. Neil Gader on getting to the essence of a loudspeaker. The real deal when it comes to high fidelity, says Sue Kraft. Neil Gader wonders if inexpensive, multichannel separates can satisfy all cravings. Jonathan Valin's think piece on realism introduces this issue's Roundtable. Triggered by HP's essay on the ASR Emitter amplifier, the TAS editorial team, Neil Gader, Wayne Garcia, Robert Harley, Harry Pearson, and Jonathan Valin, gather to explore the meaning of “realism” in audio. Paul Seydor reviews Sound Bites: 50 Years of Hi-Fi News. Anton Webern and Edgard Varèse helped change the course of music history. Ted Libbey discusses their careers and must-have recordings. The scoop on the latest from Matthew Shipp, Roy Hargrove, Bobby Previte, Mario Pavone, CUD, Odyssey the Band, and an SACD from Jaco Pastorius Big Band. Reviews of 16 new CDs and eight audiophile LPs — including the latest from Eleventh Dream Day, The Streets, Alejandro Escovedo, The Subways, Black Heart Procession, Prince, Van Morrison, Donald Fagen, Jessi Colter, Nick Cave, and Glenn Kotche. Jonathan Valin critiques five Speakers Corner Mercury Living Presence LPs. Plus, reviews of SACDs of Sibelius, Bartok, and Beethoven and CDs by Lang Lang, Dutilleux, and Christopher O'Riley, and Testament's newly unburied Wagner treasure.